Check out my Super simple snacks for Super Bowl celebrations article in the Great Falls Tribune Wednesday, February 3, 2010. Formulating a game plan for your Super Bowl party on Sunday? Why not take a page out of Peyton Man­ning’s playbook and mix it up this year? Resist the urge to call for pizza. After all, it’s the single busiest pizza delivery day of the year. Pizza Hut alone fields more than 2 million calls nationally on Super Bowl Sunday, 80 percent of which come at halftime. Instead, impress your guests with these super easy Super Bowl snacks. With a bit of pre-game prep, you’ll be ready in a snap. Whether your guests are vegetari­ans, meat-lovers, appetizer aficiona­dos or have a sweet tooth, there’s a little something for everyone in this all-star lineup. The limited number of ingredients and the simple directions combine for a winning game plan. While the Colts and the Saints are taking two weeks to prepare for the big game, your game day prep will consist of a quick dash to the grocery store and minimal cooking on Satur­day with just a few minor details to wrap up on Sunday.  ¼ cup fresh salsa (the simpler, the better. I used Amy’s organic mild salsa made with tomatoes, onions, peppers, cilantro, lime juice, sea salt and garlic). Combine diced avocados, lime juice and salsa in a medium bowl and stir gently to combine. 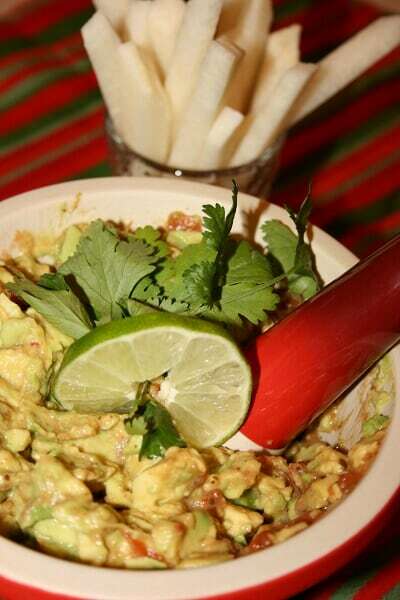 Place guacamole in serving bowl and garnish with lime slices. Serve with jicama strips for dip­ping. Serves eight. A breeze to make, with just a few ingredients and less than 20 minutes in the oven, these petite potatoes are perfect for skins because they are bite­sized and cook so quickly. Preheat oven to 450°. Wash and dry potatoes. Slice in half lengthwise. Using a melon baller, careful­ly remove one scoop of potato from the inside of each potato half. (Save potato scoops for making mashed potatoes, soup or other later use, if desired). Arrange potato skins on bak­ing sheet in single layer, skin side down. 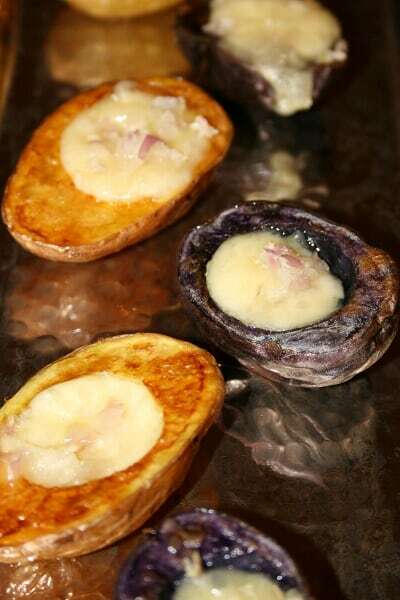 Brush potato skins with olive oil and bake on mid­dle rack of preheated oven for seven minutes. Remove from oven and turn potato skins over, skin side down, and continue baking for an additional seven minutes. Decrease oven temperature to 350°. Remove pan from oven, turn potato skins scoop side up and fill each with one brie cube and sprinkle with minced shal­lots. Return skins to oven to melt cheese and warm briefly before serving. Serves eight. *Green Giant Klondike Fin­gerlings can be found in the produce section of Albertsons Using a roasted rotisserie chicken from the deli reduces prep time considerably and mixing up the barbecue sauce is a cinch. Preheat oven to 350°. Roll cookie out to ¼ inch thickness. 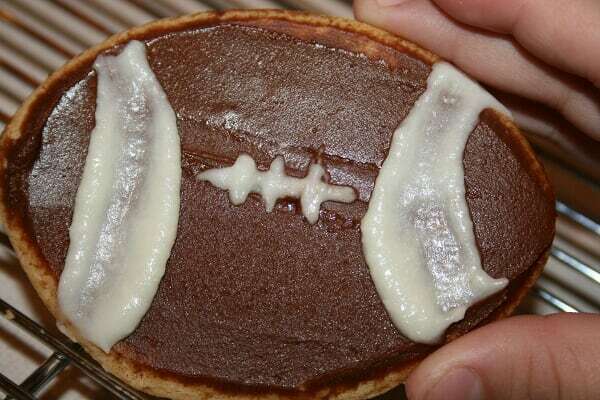 Use football-shaped cookie cutter to cut out football-shaped cookies. Bake on middle rack in preheated oven for about seven minutes. Let cool. I baked mine the night before, let them cool, wrapped them tightly in foil and froze them to frost the next day. They are easier to frost when cool. For frosting, beat together butter, powdered sugar and 2 tbsp. cream with electric mixer until light and fluffy. Add more cream if necessary. Remove ¼ cup white frosting to baggie. Set aside. In same mixing bowl, add cocoa powder, vanilla and 1-2 tbsp. cream and beat until thoroughly mixed. Frost football cookies with chocolate frosting and pipe laces and stripes of footballs on using the reserved white frost­ing in the baggie. Snip corner with scissors to squeeze out frosting. In a medium saucepan over medium heat, combine ketchup, orange juice, brown sugar, worcestershire sauce and salt, stirring to combine. Heat until sauce simmers. Remove from heat. Combine chicken and sauce in a medium bowl and stir until combined. Arrange tortilla chips on an oven-proof platter. Top chips with barbecue chicken. Sprinkle grated cheeses over chicken. Bake in preheated oven for about 10 minutes, until cheese is com­pletely melted and chicken is warmed. 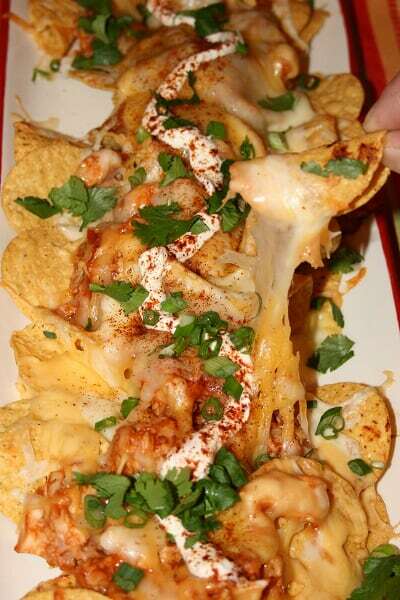 Remove from oven and gar­nish nachos with green onions and cilantro. Skip mixing and save your­self some time and dishes by buying the sugar cookie dough. You can bake them ahead and freeze them, pull them out and frost on game day.